Forget sales associates, or even personal shoppers. 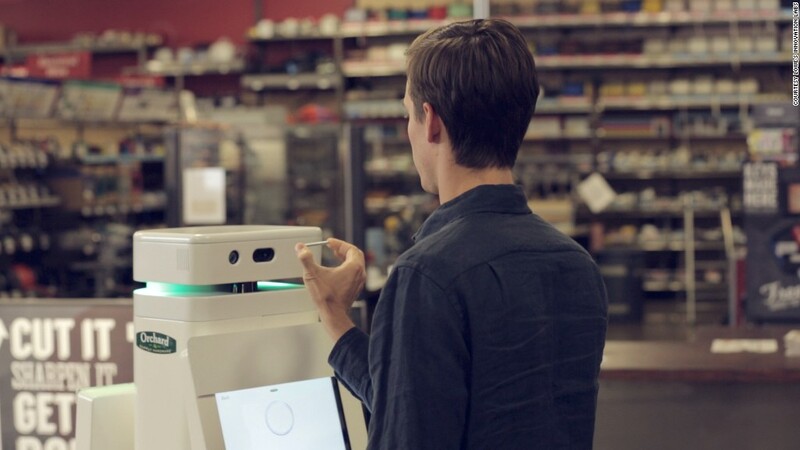 The shopping assistant of the future is a human-sized, multilingual robot, and it will be rolling down the aisles of a California store just in time for the holidays. Two robots, called OSHbots, will make their debut at an Orchard Supply Hardware store in San Jose, Calif., in the next few weeks. They can respond to people, wheel around the store and identify and track down items. ''This is something that could change retail in a meaningful way," said Kyle Nel, the executive director of Lowe's Innovation Labs, which announced OSHbot's debut Tuesday. The lab built the robots in partnership with Fellow Robots, a technology company. OSHbot is just one project that's part of the lab's broader mission of bringing futuristic ideas into Lowe's (LOW) stores and its subsidiaries, like Orchard Supply Hardware. The robot has been in the works since early this year. It's equipped with a 3D sensing camera, which enables it to analyze objects. This is especially useful for customers at hardware stores because it can identify anything that's held in front of it. Customers needing a certain size of screw or bracket, for instance, could hold it in front of the robot and it could take them to the correct aisle. "You don't have to wander around just to find out we don't have it, or even worse, buy it and bring it home and realize that's not the thing," Nel said. OSHbot also knows exactly what the store has and where it is, which can't always be said for human associates. What the heck is that? The robot knows. OSHbot can also have conversations like a person. It will be able to speak in English when it hits the first store, with more five more languages added in the coming months. Nel said that was important because it makes the store more accessible for all customers, no matter where they're from. For now, only two robots will be in the Silicon Valley hardware store, and it may be a little while before OSHbots hit more Orchard or Lowe's stores around the country. The OSHbot is still in its testing phase, and the San Jose store is close enough to the Lowe's lab that technicians can keep a close eye on how the robots adjust and how customers respond. "People say to me, 'You can put a man on the moon but I can't find someone to help me when I'm in the store?'" Nel said.